National Geographic understands all too well the importance of the Okavango Delta. Since 2015, a team of scientists led by National Geographic fellow Dr. Steve Boyes has surveyed the sprawling waterways, an integral water source for over one million people, as well as the scores of animal species that rely on the Delta for survival. To raise awareness and share their results from the three-year expedition, National Geographic released its feature-length documentary, Into the Okavango, at the Tribeca Film Festival in December. It tracks the team as they embark on a 2,400km-long journey across three countries and is a worthwhile watch if you’re thinking about visiting Botswana – why not watch the documentary and then visit the place up-close in 2019? In 2016, Botswana made Lonely Planet’s ‘countries to visit’ list due to its spectacular wildlife. 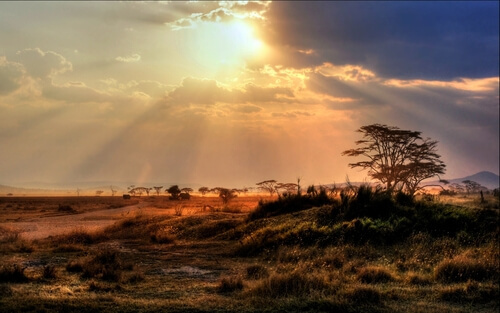 With national parks including the Chobe National Park and Central Kalahari Game Park, it’s not hard to see why it continues to grow its reputation as one of the best safari destinations in the world. Chobe National Park houses the largest elephant population of any area in the world, currently estimated to exceed 120,000. Add equally large herds of buffalo, as well as leopards, lions and African wild dogs, and you have a pretty fabulous place for game spotting. A sunset cruise on the Chobe River is an unforgettable way to end the day and is an opportunity to view wildlife from the water. Look out for hippos and crocodiles who share the river with thousands of bird species, including numerous species that are rarely found elsewhere. Botswana’s Central Kalahari Game Reserve is a national park based in the Kalahari Desert and the second largest game reserve in the world. The arid, harsh terrain is home to jackals, cheetahs and hyenas, among others, making it a fantastic location to see animals difficult to spot elsewhere. Botswana has made a name for itself as a premier destination for travellers who want to experience the African bush in plush surrounds. One lodge due to open in July 2019 is Tuludi Camp, located in the Okavango Delta. Set within a private reserve, guests can choose to either wait for the wildlife to wander past them while lounging by the pool or, join one of the many activities available: think walking safaris, private game drives or cruises on the Delta. The camp will feature only seven luxury tents. Expect al fresco baths and showers and a private plunge pool. In 2019, Wilderness Safaris will also be rebuilding its Jao Camp. With five tents and two ultra-luxe villas, the entire property will be situated on the waters of the Okavango Delta, making your bedroom the prime viewing spot – you can’t get better than that. 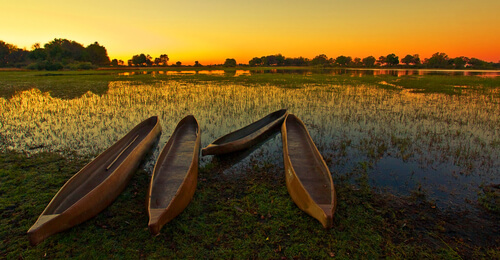 One of the most popular activities in Botswana is experiencing the Okavango Delta, the famous waterway and lifeblood of the country. There are two main ways to experience the Okavango Delta, and the question isn’t which to choose, but how to do both (keep in mind the Delta swells in size during the wet season). The first option is from the air. Take a light aircraft from nearby Maun, where you’ll swoop across the grasslands and track the Okavango Delta. With a hard-to-beat birdseye view, you’ll be able to spot herds of elephants gathering at the water’s edge or witness giraffes gallop across the wetlands. The second is by water. 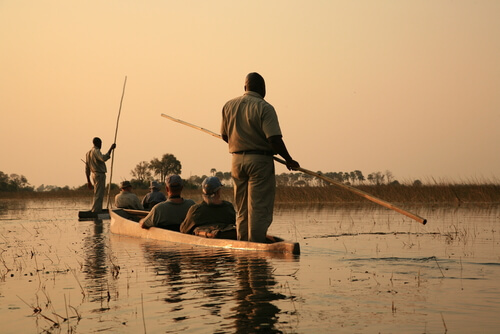 Drift along the Okavango Delta in a mokoro, or dugout canoe. Similar in style to punting, one or two passengers sit in the mokoro, while a guide uses a ngashi (pole), to push the mokoro along. Exploring the Delta this way means you stand the chance of coming eye-to-eye with hippos and crocodiles as well as wildlife that come to rest and drink at the water’s edge. If you do decide to traverse the Okavango Delta by mokoro, you’ll usually have the option of camping overnight on one of the islands. There’s nothing more magical than sleeping under the African night sky while being lulled to sleep by the sound of animals – a hippo snort just metres from you is an experience you won’t forget quickly! When we say 'camping' we mean safely inside a lodge - you don’t want mosquitos to be the most memorable part of your trip! Though Botswana’s cuisine is similar to neighbouring South Africa with a heavy emphasis on meat dishes, there are a number of tasty dishes distinctive to Botswana that shouldn’t be missed. Seswaa is a meat dish often served at important or traditional events and is similar in style to a casserole or stew. Made from beef, chicken, lamb or goat, the fatty meat is boiled with onion and pepper for hours or, until tender. 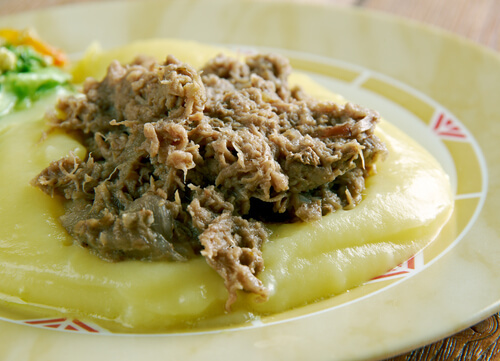 The meal is then shredded or pounded and served with polenta.